Since my article on the green recovery, we know that what is referred to as green jobs may be a very good thing for the United States as it would create two million jobs. This is fine, but what about the rest of the job ? A study from the United Nations provides us figures and data on how up to 20 million jobs could be created worldwide. (…) Changing patterns of employment and investment resulting from efforts to reduce climate change and its effects are already generating new jobs in many sectors and economies, and could create millions more in both developed and developing countries. However, the report also finds that the process of climate change, already underway, will continue to have negative effects on workers and their families, especially those whose livelihoods depend on agriculture and tourism. Action to tackle climate change as well as to cope with its effects is therefore urgent and should be designed to generate decent jobs. Though the report is generally optimistic about the creation of new jobs to address climate change, it also warns that many of these new jobs can be “dirty, dangerous and difficult”. Sectors of concern, especially but not exclusively in developing economies, include agriculture and recycling where all too often low pay, insecure employment contracts and exposure to health hazardous materials needs to change fast. (…) Green jobs reduce the environmental impact of enterprises and economic sectors, ultimately to levels that are sustainable. 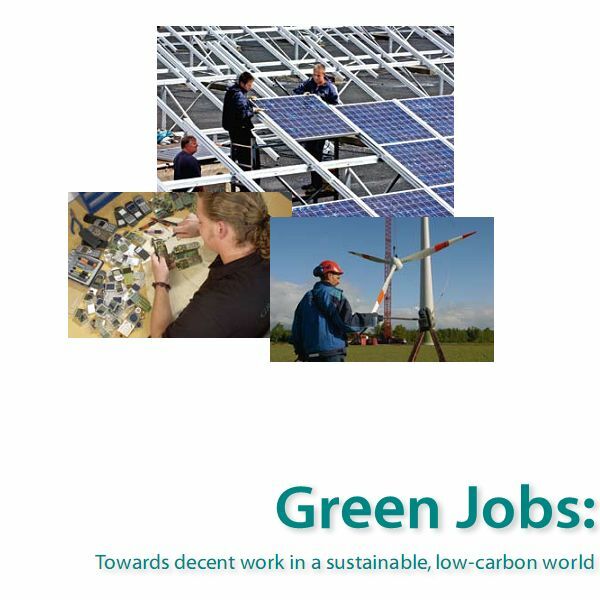 The report focuses on “green jobs” in agriculture, industry, services and administration that contribute to preserving or restoring the quality of the environment. It also calls for measures to ensure that they constitute “decent work” that helps reduce poverty while protecting the environment. The report says that climate change itself, adaptation to it and efforts to arrest it by reducing emissions have far-reaching implications for economic and social development, for production and consumption patterns and thus for employment, incomes and poverty reduction. These implications harbour both major risks and opportunities for working people in all countries, but particularly for the most vulnerable in the least developed countries and in small island States. – The global market for environmental products and services is projected to double from US$1,370 billion (1.37 trillion) per year at present to US$2,740 billion (2.74 trillion) by 2020, according to a study cited in the report. – Sectors that will be particularly important in terms of their environmental, economic and employment impact are energy supply, in particular renewable energy, buildings and construction, transportation,basic industries, agriculture and forestry. – Clean technologies are already the third largest sector for venture capital after information and biotechnology in the United States, while green venture capital in China more than doubled to 19 per cent of total investment in recent years. – 2.3 million people have in recent years found new jobs in the renewable energy sector alone, (…) Employment in alternative energies may rise to 2.1 million in wind and 6.3 million in solar power by 2030. – A worldwide transition to energy-efficient buildings would create millions of jobs, as well as “greening” existing employment for many of the estimated 111 million people already working in the construction sector. – Investments in improved energy efficiency in buildings could generate an additional 2-3.5 million green jobs in Europe and the United States alone, with the potential much higher in developing countries. – Recycling and waste management employs an estimated 10 million in China and 500,000 in Brazil today. This sector is expected to grow rapidly in many countries in the face of escalating commodity prices. For more on this most interesting report, please download the pdf document (4.48 Mb) straight from the United Nations’ website.